Reaching the recess where the openings to the three separate mineshafts, I called UOPETA and THEROS back to me. Luckily they hadn't made much progress, and I could see both of them from their respective entrances. UOPETA and THEROS emerged looking confused; it wasn't the first time this week that I had interrupted iron mining because of a discovery. "What? What is it? Is it AMPHIS?" Yes and no... 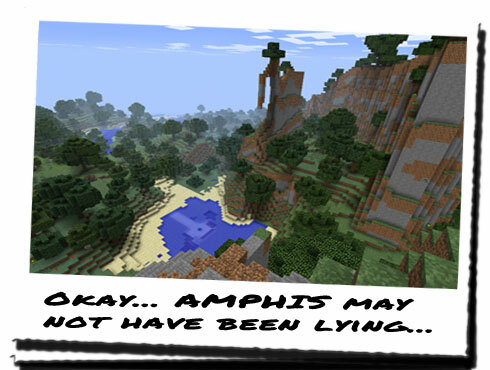 I explained that I went back to the site where AMPHIS had stopped and stared at the lava, stating that someone had disappeared in front of him. "Yeah, so... What of it? Did you find anyone?" I led the way down the route that we had taken initially giving chase to AMPHIS, who in turn was chasing this unknown phantom, which turns out could be real! We passed lava flows, and other areas we had passed before, and as the passage began to grow darker, I knew we were drawing near. 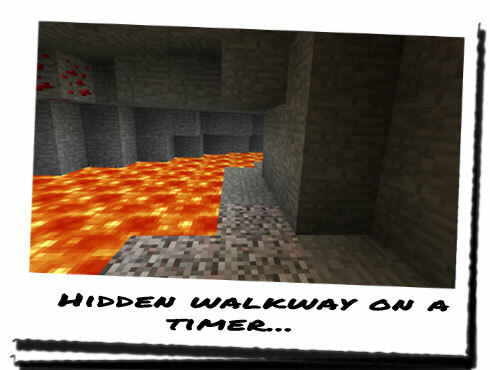 Rounding the final corner, we were once again presented with the same lava pit. "Right, where is this button then...?" I pointed up to the right of the lava pool, quite high hidden within a little niche. Following my pointed finger, UOPETA went over to the spot, and leaned up and forward. He whispered something to himself, before reaching forward and pushing the button. Jumping back down in time, both UOPETA and THEROS witnessed the same portion of the wall slide inwardly, a small delay, and then began protruding out again, covering up the path. "Well I'll be damned... Syeonyx is right..."
This time THEROS reached up and pressed the button, and was met with the exact same action. 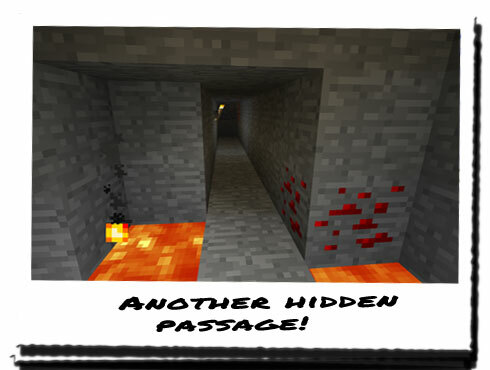 We all stood back from the lava pit, astounded by what we had found. This was the point that AMPHIS had chased this phantom up until, before losing them. I highly doubt AMPHIS's sub-conscious would lead him to an actual secret! He had never been down here before, none of us had, so none of us knew about that. It would explain that AMPHIS had a reason to come down here; he had obviously followed someone down here, who had pressed the button and escaped along the thin passageway beyond it. "AMPHIS was right... He did see someone..."
"Still, there's no proof that it was SERVERE though... We need to know where this goes and report it to COLUS. We could be on to something big. If this is being used by HoN Co. ... I don't even want to think about it..."
UOPETA reached up again, and pressed the button. This time though, instead of standing back and watching it, he crept forwards towards the wall and moved past it when it was fully retracted. The wall began to slide back into place, so we would have to go one by one. I went next; reaching up and pressing the button, I moved into position, and when there was enough space, I slid past. Watching the wall move back into place, we waited for THEROS to come across. After THEROS was on the same side as us, we individually made our way across the precarious path; a small stone walkway was position between two small pools of lava, making traversing it very difficult. One slip, and we were dead! We stopped at what appeared to be a dead end, but UOPETA had already begun looking for a button to open it. Not long after searching, he found something hidden beneath an outcropping quite low to the lava. Reaching down, he pushed it, and stood up right; he was rewarded with the wall in front of us moving to one side, exposing another tunnel, lit by a solitary torch. "Looks like we've got a way to go..."
We all went into the passageway, one by one, with me in the lead. I was the only one with any form of offensive weapon, in the form of the pickaxe, so it only made sense for me to go first. I made my way up the surprisingly well-lit passageway, which ascended for some time, before ending in a corner that veered off to the right, only to begin ascending again. I could see something way off in the distance, but I couldn't make out what it was. I was cautious; if whoever had made this had any sense, they would likely have installed traps or some mechanism to deter us any further, but so far, we had progressed unhindered. UOPETA suggested that we keep stopping every now and again to see if we could hear anything nearby that might be drowned out by our own footsteps, and every now and again we did just that. We heard nothing that suggested anything hidden or dangerous aside from the sound of distance rushing water... As we continued to ascend, I began to think how far we had gone up. 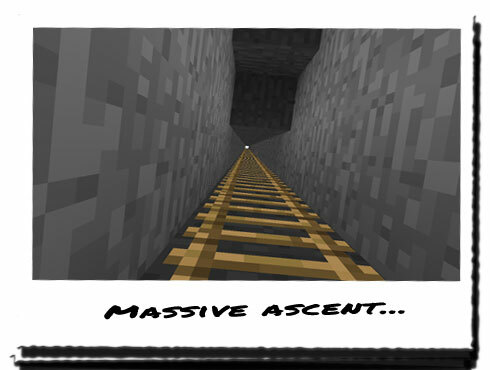 I don't remember the cliff mine being this deep, and we had started from way above sea level... How far up did it go...? But that wasn't what had the attention of most of my thoughts. My eyes were almost constantly fixed on the object I could see up ahead, and as I grew closer and closer, I was able to make out it was something constructed of wood... Odd... Was it a door, or a hidden wall...? But when we were within less than one hundred metres of it, I recognised it to be some form of ladder; the wooden parts I had seen as the rungs stretching horizontally across two main beams either side of it. When we reached it, I could't believe it; not only had we ascended for some time, but the ladder went up even further, for a massive vertical distance! "Erm... Okay... Where do you think that leads...?" "Judging from the height of the ladder, and the height we've already come based on the ascending staircase, I'd say on top of a cliff somewhere..."
I began to climb the ladder, a little worried about the height of the entire thing. I wasn't the most confident person when it came to ladders, and tackling one this tall wasn't helping much. After ascending a few metres, I had figured out that I was slightly more confident, and therefore made slightly faster progress if I neither looked up or down, instead only concentrating on the next rung up. Trying to focus on this was difficult though as once again, UOPETA wanted to be kept informed about how far we had left to go, and whether there was anything else up there. All I could see were the sides of the hole, the ladder above me, and the sky... There was nothing else to see which hinted at where would come out. Continuing despite UOPETA, I eventually made it to the top; climbing free of the claustrophobic hole and standing on solid ground, I began to look around, and was slightly confused when all I saw was the occasional tree and more sky... I looked down, and began to feel nauseous... How was this possible?!?! UOPETA stood beside me and also looked down. From the overwhelming silence, I could only assume that he was thinking the exact same... THEROS emerged from the hole and was as surprised as we were! "Okay, I had a feeling this would be the case..."
I couldn't believe it... We were standing on top of the what is the cliff mine, able to look out across the entire area below us! From our vantage point, we could even see the walkway to our base through the hatch! This was bad... Very bad! "COLUS needs to know about this... Now!"